Yoel Ben-Simhon & The Sultana Ensemble had performed at numerous venues throughout the US, Europe and Israel, including Theatro Manzoni-La Scala in Milan Italy, Lincoln Center Festival, the United Nations General Assembly Hall, Celebrate Brooklyn Festival, the Jewish Museum, Chicago Cultural Center, The HotHouse Chicago, and in New York¹s main music scenes; Symphony Space, Metropolitan Museum, The Jewish Museum, Joe¹s Pub, Knitting Factory, Satalla, and Makor 92nd Street Y. The ensemble had performed with internationally known artists such as Yossi Fine, George Mgrdichian, Howard Levi, Rachid Halihal, Yair Dalal, Bassam Saba, Haig Manokian, Souran Baronian, Frank London, Matisyahu, Kenny Muhammad, and Yosi Piamenta to name just a few. The instruments will include: vocals, oud, flamenco guitar, viola, flute, nay, sax, bass, hand drums, and dancers. The musical experience of Yoel Ben-Simhon & The Sultana Ensemble introduces the audience to music from all around the Near East and the Mediterranean region and demonstrates how cultures and religions coexisted and influenced musicians over time. 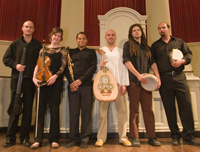 The program includes original compositions as well as unique arrangements to some traditional music from the Jewish Sepharadic/Mizrahi and Arabic cultures.